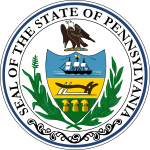 The 1908 United States presidential election in Pennsylvania took place on November 3, 1908, throughout 46 states (Arizona and New Mexico were still territories that would participate in the next election). This was the first presidential election in which Oklahoma participated. Voters chose 34 representatives, or electors to the Electoral College, who voted for president and vice president. Pennsylvania overwhelmingly voted for the Republican nominee, Secretary of War William Howard Taft, over the Democratic nominee, former U.S. Representative William Jennings Bryan. Taft won Pennsylvania by a landslide margin of 23.43 percentage points. ^ David Leip. "1908 Presidential General Election Results – Pennsylvania". Dave Leip’s U.S. Election Atlas. Retrieved 2018-03-24.